Headaches come in a variety of forms, depending on their causes and symptoms and headaches are deemed to be a global symptom for underlying conditions, ranging from minor, easily preventable issues to those more sinister in nature. This is why clarity on one of the most common, treatable and preventable types of headache, the tension-related type, would be useful in terms of self-diagnosis and self-help. To distinguish the type of headache you might be experiencing, consider the location of the pain as this can provide clues. (See Figure A). Nearly all of us have had a tension-type headache, but most of us believe we can handle it, taking over-the-counter pain relief and before long the headache is gone. Millions, however, encounter headaches that are so painful, debilitating or frequent that they spend their days waiting for 'it' to attack and then retreat! This is the difference between 'episodic' and 'chronic' tension-type headaches. 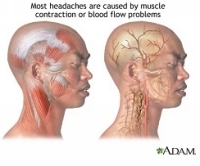 The exact cause or causes of tension-type headaches are unknown and until a few years ago, many researchers believed that the pain of tension headache stemmed from muscle contraction in the face, neck and scalp, and blood vessel restriction, perhaps as a result of heightened emotions, tension or stress. (See FigureB). Recent research suggests that muscle tension as a dominant trigger to tension headaches is not as infallible as once thought and so the term 'tension-type headache' is now used by The International Headache Society instead of 'tension headache' to illuminate this belief. Keep a diary - especially if you suffer with frequent headaches. 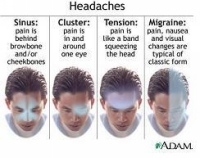 Note when, the severity and the duration of each headache. The key thing is to identify your personal headache triggers by noticing a pattern of work habits/foods/stress levels/anger levels/eye strain that is present prior to your headaches. Once you find a trigger, avoid it and see if the occurrence of headaches is consistent with that trigger. Stress and Depression - this is a very common trigger so avoid stressful situations where possible or at least consider your mindset on how you react to potentially stressful situations. Learning to cope with stress and to relax may help. There are so many options, from breathing and relaxation techniques, (i.e. yoga, Pilates, Thai chi classes), books and tapes, or referral to a counsellor or physiologist is sometimes advised. Regular exercise - research shows headache occurrence is higher in people who don't exercise! This may relate to the stress-release achieved through exercise or through postural and blood circulation improvements. Either way, it works so make sure you have a regular regime. Have a 'Recovery Plan' - If your lifestyle involves a lot of sitting in a car, at a desk/laptop, then you need to have a system in place to undo the muscle tension/spasm created during these prolonged imbalanced stresses on the neck and shoulders. This would include getting enough sleep and rest, stretch daily or get regular massage for sore, tired muscles. Exercise would also play a vital role within your recovery plan to correct muscle imbalances that could leave you susceptible to the occurrence of a headache. Medication - Over-the-counter analgesics such as aspirin, ibuprofen, or acetaminophen may relieve pain if the above measures are ineffective. An antidepressant or other medication may be advised for chronic headache. A nonsedating muscle relaxant helps some patients. A lifestyle change - Lifestyle changes may be required for chronic tension headaches. This may include adequate rest and exercise, change in job or recreational habits, or other personal changes. Did you know In a recent survey of 274 Nutracheck Members 2 in 3 people found our food diary approach more successful than their previous weight loss attempts! !